2 × Exhaust Tailpipes. Audi A3 2011 2012 2013 2014. Suitable for Audi A3 2011 ~ 2014. Material: 201 Stainless Steel, with injection molding technology. Notice: This item fits for both exhaust pipes on one side. Audi A4 B8 1.8T 2.0T 2009-2012. Audi Q5 2.0T 2010-2012. ☆ Material: Stainless Steel, with injection molding technology. Notice: This item fits for both exhaust pipes on one side. 2 × Exhaust Tailpipes. Black Cerakote Tip Trim 100mm GT100 x2. Milltek Classic. Audi S7 Sportback 4.0 TFSI quattro S tronic (2012 and later). Audi S5 3.0 TFSI B8.5 Coupé & Cabriolet (2011 and later). Audi S5 3.0 TFSI B8.5 Sportback (2012 and later). Jetex Performance Exhausts, Since 1986. A fitting kit is provided with every Jetex system. (see pictures). Audi A3 8P 1.4 2.0 Turbo Jetex Performance 3″ Stainless Steel Race Pipe Silencer Delete Performance Upgrade. Audi A3 2011 2012 2013 2014. ☆ Material: Stainless Steel, with injection molding technology. Note : This item fits for both exhaust pipes on one side. 2 × Exhaust Tailpipes. Long edge: 14.0cm;. Short edge: 11.5cm. EXHAUST TAIL PIPE REMOVED FROM A 2004 AUDI A4. GLASS AND BODY PANELS. WHEN WILL MY ITEM ARRIVE?. Make sure you are buying the correct item as it is your responsibility to make sure the part you are buying will fit your vehicle. FOR YEARS: 2012, 2013, 2014, 2015, 2016, 2017, 2018 (2015). EXHAUST BACKBOX AND CENTRE SECTION. Audi Breakers. Seat Breakers. Gearboxes must be filled with new oil upon installation. Gasket and seals need to be replaced before installation. Part number: 8U0071761. The box is opened although the trims are new and unused, p lease view pictures to see the condition of the item prior to buying. Model: A3 8V Sport. Make: AUDI. Body style : Sport. AUDI A3 1.4TFSi (CAXC engine) 9/07-8/12 (1st connecting pipe). SEAT ALTEA 1.4TSi (CAXC engine) 11/07- (1st connecting pipe). SEAT ALTEA XL 1.4TSi (CAXC engine) 11/07- (1st connecting pipe). SEAT LEON 1.4TSi (CAXC engine) 11/07- (1st connecting pipe). AUDI A3 1.4TFSi (CAXC engine) 9/07-8/12 (2nd connecting pipe). SEAT ALTEA 1.4TSi (CAXC engine) 11/07- (2nd connecting pipe). SEAT ALTEA XL 1.4TSi (CAXC engine) 11/07- (2nd connecting pipe). SEAT LEON 1.4TSi (CAXC engine) 11/07- (2nd connecting pipe). AUDI A3 1.2TSi (CBZB engine) 4/10-5/13 (1st connecting pipe). SEAT ALTEA 1.2TSi (CBZB engine) 4/10- (1st connecting pipe). SEAT ALTEA XL 1.2TSi (CBZB engine) 4/10- (1st connecting pipe). SEAT LEON 1.2TSi (CBZB engine) 2/10- (1st connecting pipe). 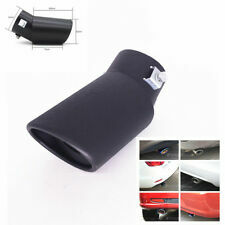 If your tailpipe is facing downwards you will need the help of a car-service in order to install it on your car. they are tried and fit 99% of cars. 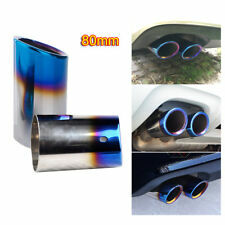 Can this exhaust tail pipe tip fit any car?. the exhaust tail pipe tip is universal, so will fit most cars. 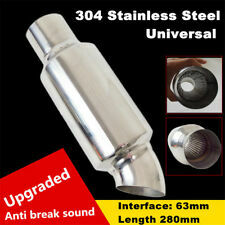 Stainless Steel Grade 304 Twin Tail Pipe Tip. How can I fit the exhaust tail pipe tip?. depending on type of car you have and how your existing tail pipe is there are a number of ways as follows. IT IS A ALUMINIUM MATT TAILPIPE. TWIN SQUARE EXIT STAINLESS STEEL EXHAUST TOP - 240MM LONG. CLIP ON PIPE - NO WELDING NEEDED. Replaces MSAU618 or MSAU618REP – Louder Than MSAU618. Louder Than MSAU618 But Quieter Than MSAU618REP. By fitting Milltek exhaust components you can rest assured that these are very high quality, high-performance parts that will in most cases out live the car. 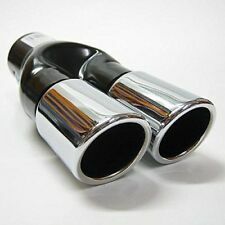 TWIN SQUARE EXIT STAINLESS STEEL EXHAUST TOP - 240MM LONG. CLIP ON PIPE - NO WELDING NEEDED. 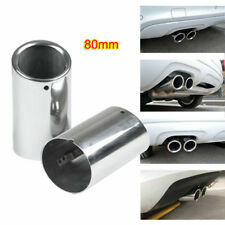 HIGH QUALITY STAINLESS STEEL UNIVERSAL EXHAUST TIP PIECE. ALTEA (5P1) MPV 2004 - 2016. ALTEA (5P1) MPV 2005 - 2016. ALTEA XL (5P5, 5P8) MPV 2006 - 2016. Not interested in spending over 100£ on a single silencer?. We have the perfect solution for you. TOLEDO III (5P2) MPV 2004 - 2009. OCTAVIA (1Z3) Hatchback 2010 - 2013. OCTAVIA Combi (1Z5) Estate 2010 - 2013. Not interested in spending over 100£ on a single silencer?. We have the perfect solution for you. Exhaust systems. Exhaust with mounting kit. If your tailpipe is facing downwards you will need the help of a car-service in order to install it on your car. Section Box With Tail Pipe. Wheel Trims. Search for over 20,000 accessories. Fuel & Oil Additives. Car Care Essentials. Coil Springs. Car Batteries. Air Fresheners. Centre Exhaust Pipe. 1 x Centre Exhaust Pipe. This Centre Exhaust Pipe fits the following vehicles. Fits Front Wheel Drive Vehicles. Need help finding thecorrect part?. Engine Fuel Body type Start year End year BHP Engine No. OCTAVIA (1Z3) Hatchback 2008 - 2013. OCTAVIA Combi (1Z5) Estate 2008 - 2013. Not interested in spending over 100£ on a single silencer?. We have the perfect solution for you. . Exhaust systems. UNIVERSAL PERFORMANCE STAINLESS STEEL TAILPIPE TRIMS PAIR. 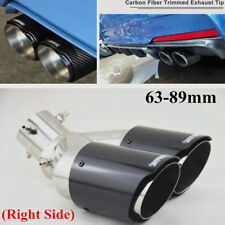 This is a high quality pair of Universal Performance Stainless Steel Exhaust Tailpipe Trims. Quality grade stainless steel. Superior TIG welding. ROUND BIG BORE EXIT MATT BLACK STEEL EXHAUST TOP - 220MM LONG. CLIP ON PIPE - NO WELDING NEEDED. ALTEA (5P1) 1.4 TSI 11.2007 - 05.2011 1390 125 92 YES CAXC. ALTEA XL (5P5, 5P8) 1.4 TSI 11.2007 - 05.2011 1390 125 92 YES CAXC. LEON (1P1) 1.4 TSI 11.2007 - 12.2012 1390 125 92 YES CAXC. Mounting kit. Klarius Centre Pipe to fit 110, 90 2.5 86-90. Section Centre Pipe. Wheel Trims. Search for over 20,000 accessories. Fuel & Oil Additives. Coil Springs. Air Fresheners. Air Compressors. Exhaust aperture & end pipe pieces. Shift boot and shift boot. Back saver for seats. -Audi A3 8V 2/3-door 1.4 TFSI 1.8 TFSI 2.0 TFSI 2.0 TDI. Steering wheel covers / steering wheel cover. -Audi A3 8 p 2/3-door 1.4 TFSI 1.8 TFSI (nur ab 11/2008). Section Box With Centre Pipe. Wheel Trims. Search for over 20,000 accessories. Fuel & Oil Additives. Car Care Essentials. Coil Springs. Car Batteries. Air Fresheners.